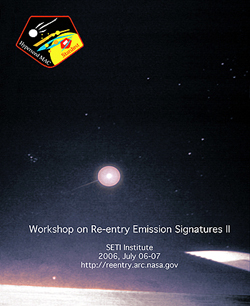 This 2-day workshop intends to bring observers, laboratory investigators, and theoreticians together to compare notes on the investigation of the Stardust Sample Return Capsule reentry on January 15, 2006. The deadline for workshop registration has passed. A preliminary agenda is posted at: http://reentry.arc.nasa.gov/agenda.html and will be updated as abstracts are received. Check for the final version on July 05 21h UT. An airborne and ground observing campaign was executed to test thermal protection systems in the fastest reentry since Apollo and probe the delivery of organics for life's origin by measuring the physical conditions during reentry. The heat shield was recovered and is now being studied for evidence of ablative performance of PICA in a real-to-life test and for the physical and chemical signatures of ablation products still sticking to the surface. The results of this work are to improve models of radiative and convective heat flow in faster-than-escape speed reentries in Earth's atmosphere and support the development of a Crew Return Vehicle thermal protection system. The registration form provides contact information about lodging in the neighborhood of the SETI Institute (within walking distance): - The Ramada Inn ($59.- + tax) can be reached at 1-650-967-6856 - The Quality Inn next door ($80.- + tax, ask for the rooms with separate living room area) can be reached at 1-650-934-0155. From San Jose or San Francisco Airport by car: Highway 101, in direction of Mountain View Take exit Ellis Street. Down at the ramp if you come from San Jose: take a left to pass under the highway. From San Francisco: stay on this side of the highway. Then take immediate right and follow Fairchild Drive parallel to highway in direction of San Francisco. Two blocks down (green sign "Whisman") take left on Whisman road The SETI Institute is on your left hand side, just before traffic light. Registration is in the entrance hall with the receptionist. On Thursday evening, we provide a dinner buffet and video showing (until 9 p.m.). The banquet is on Friday evening at a local restaurant on Castro Street in Mountain View. Lunches are catered at the Institute. If any problem arises, you may contact the SETI Institute at: 1-650-961-6633.